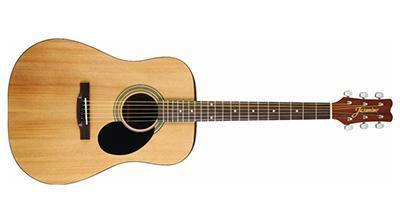 →What are the Best Cheap Acoustic Guitars? If you are looking for an acoustic guitar on a budget, you might be surprised at just some of the acoustic guitars that are available today which not only deliver on price, but also on quality and sound. Since their introduction to the world more than five centuries ago, acoustic guitars have come to play a prominent role in many forms of musical compositions. There are probably as many types of acoustic guitars as there are compositions involving them today. The fact that these types of guitars are relatively easy to learn and readily usable has supported their ever-growing appeal. If you’re looking to purchase an acoustic guitar; the chances are that you have been confounded by the numerosity of the options on the market. The good news is that there is an acoustic guitar for every purpose – and regardless of your budget you can get a top quality product. In this article, we’ll briefly review five brands of cheap acoustic guitars, which are arguably some of the best in the market today. See our full review of the RA-090 here. Like other Rogue products, the RA-090 Dreadnought is an ideal instrument for beginners. This guitar is designed lightweight with a wide and deep body made of whitewood; this ensures that the sound it makes is projected wide and is very clear. It also comes with a broad C-shaped neck made of solid nato wood; this ensures free movement on the fret without loss of tone quality. The fret board and bridge of this dreadnought are made from rosewood; which guarantees the clarity of each note and gives the guitar a classic appearance. It also includes covered tuners and nickel hardware. This dreadnought is comparable to any top selling acoustic guitar on the market as far as performance goes, and at just $59.99; it is a steal. Specifications: 20 frets (14 open), 6 strings, 25-3/8” scale length and 1-2/3” nut width. This is another highly recommended cheap acoustic guitar for beginners. This Rogue guitar is built particularly small; this makes it ideal for children. Although it is small compared to the standard guitar, the body of the Rogue Starter has enough depth to produce a distinct sound from some distance. The neck of this guitar is made from maple wood and its fret board from rosewood; providing it with just the right balance of flexibility, clarity and aesthetic appearance. It also comes in five colors – blue, red, pink, black and matte brown. As far as cheap acoustic guitars go,Rogue Starter is one of the lowest; priced at only $41.99. Specifications: 20 frets, 6 strings, 7/8” scale length, 1 nut width. See our full review of the Jasmine S35 here. This acoustic guitar by Takamine is great for beginners and it also comes highly recommended for experts as a second guitar. The Jasmine S35 is a classic acoustic guitar that is marked by close attention to detail. The satin finish and its spruce wood body gives the guitar an artful appearance and a distinct sound. The Jasmine S35 also features the X-bracing system; which strengthens the quality of its notes by allowing the sound board vibrate freely. Its wide rosewood fret, supported by a sturdy nato wood neck, also guarantees that musicians can maneuver their fingers freely on the wide fret board without affecting the sound of their notes. With a lifetime warranty attached to this product, there’s no reason not to choose this Jasmine S35 acoustic guitar. Specifications: 20 frets, 6 strings, 12” fret radius, 25.5” scale length, 1 nut width, full body binding, chrome tuners. See our full review of the DR-100 here. This is one of the best selling acoustic guitar brands in the market today. Epiphone’s DR-100 is suitable for both professional players and rookies, and it can be used to jam to just about any genre without any problems with the quality of the sound produced. The body and neck of this guitar are made from strong mahogany wood that guarantees its longevity. Its spruce top also has a laminated finish that gives this guitar an excellent appearance. 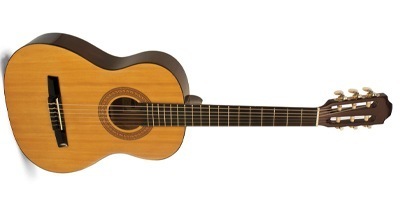 Hohner HW03 Sized Steel String: This acoustic guitar is specially designed for children between the ages of 8 and 10. It also makes a great instrument for music teachers as it is relatively easy to play and produces professional-sounding notes. Hohner HW03 is designed with a mahogany body (in some editions, basswood is used to make the back and sides instead of mahogany) and spruce top; which provides just the right surface for the notes to resonate. The neck, which is also made of mahogany, features a fret board built with rose wood. The neck of this guitar is designed to permit easy movement of the hands on the fret. This guitar is also built according to Hohner’s A+ Advantage System; which introduces more than 35 new improvements to the traditional acoustic design technique – resulting in all round better performance and an increased lifespan for the instrument. Hohner HW03 3/4 Sized acoustic guitar is inexpensive – get one today and set your child on the way to becoming a maestro on the strings. Specifications: 20 frets, 6 strings, 23.5” scale length, inline tuners, adjustable tension rod. Although they labeled as cheap acoustic guitars, the instruments listed here represent some of the best brands in the market – comparable to any high end product. Their manufacturers have sought to create affordable products without sacrificing quality and performance. If, however, you find any fault with the guitar you purchase, feel free to contact its manufacturer for support. These companies are usually eager to assist customers resolve any difficulties they encounter with their products. Some cheap acoustic guitars even come with warranties. Ultimately, the best way to know if a particular guitar is good for you is to try it out. Some musicians tend to have a connection with some instruments and are at their best when they used them. Most music shop allow customers to try out the instruments before they take them home, but if you aren’t permitted to do this, consult as many customer reviews of the product as you can lay your hands on.